Is your gardening space limited? By growing your crops vertical you will save valuable garden space. And using no-dig garden techniques and Square Foot Gardening methods, you can take those small areas in your backyard or by the driveway and create an enchanting small space garden. In one 4-foot square area you can grow enough food for two people. If you have more room you can add another 4-foot square. If you only have a one-foot deep area you can set your garden area up in a long one-foot row that uses the small space area that is available to you. You can also add a few hanging baskets to your porch or balcony area. And don’t forget those windowsills! Even apartment and city residents will be able to produce their own fresh produce. Select a spot in your yard, patio or patio that receives six to eight hours of sunlight. Buy or find boards that are one foot deep, one foot high and as long as your yard will handle. I still keep the sections at four to six foot for easy handling. 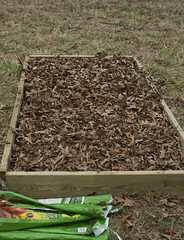 Assemble the boards to make a rectangular form that you can fill with soil, compost or straw. You will not need a bottom for this. Place you form where you want your garden. You can use bricks or cement blocks for your raised garden. And by all means if you can find boards without purchasing them, you can use that money for seeds! Since you are adding this form on top of the garden you will need to add a soil mixture. You can buy soil or use compost you have made, or you can use a no-dig garden method where you create your own soil. Start by placing cardboard on the bottom of your form. This will stop any grass or weeds that is there from sending out roots. It also helps the soil to break down and will add nutrients to the new soil mix. Next add grass clippings or old leaves. Top with a layer of straw, add soil or compost next if it’s available. Many people will add peat at this stage. Top this mix all the way to the top with straw and water to hold in place. Let set for a few days and top again with straw. I usually add a little compost to the top. Your new raised bed garden is almost ready to plant. Now that the form is weighed down with a soil mix I add a trellis or wood poles to the back. This allows me to grow tomatoes, beans, squash, cucumbers and any other sprawling vegetable vertical instead of the plant taking up space on the soil. Make sure that the trellis or poles are very secure. They will hold a lot of weight. This also leaves the front open for smaller crops, herbs and flowers. If you place you plants using the Square Foot Gardening technique you will make the best use of you soil and assure that you have healthy crops. The No-Dig garden is very versatile and will fit your needs and budget. You can buy soil, make your own or even try straw bale gardening where you plant directly into straw bales. And don’t forget hanging baskets. They will hold, flowers, vegetables and herbs for extra growing room plus they have the benefit of adding beauty to your porches and balconies.